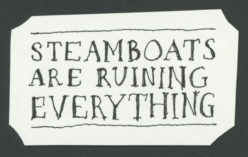 Bless you, Caleb, for pointing out that this guy's steamboats are indeed ruining everything, but it sounds as if his thesis has all the airtightness of an ideological wet suit. What allows a PhD candidate not to notice that the ground for his argument has been pulled out from under him in public? Why didn't he break down and cry after you asked your question? We're bombarded with cocksure idiots for whom facts and history are minor annoyances. Just today: Bush responds to the report that all sixteen American intelligence agencies had corroborated the international investigation that found Iran's supposed nuclear weapons program to be defunct by saying that this corroborated his view! Did he not notice that his view was entirely demolished by the report? On the global warming front, I read recently that 150 major corporations, including Shell Oil, have signed onto a petition that says that they would support mandatory (i.e. governmental) emissions caps on their industries. So this provides another line of attack on your friend: if governmental regulations are so bad for the economy, then why would Shell Oil support them? THink that might let some air in? Hi, Ben! Well, he didn't break down because I wasn't anywhere near as persuasive as I retrospectively made myself seem in my post, and he seemed to be winning the night's debate. He had a lot of facts at his disposal, just not the Clean Air Act. I enjoyed Biden's incredulity in this morning's New York Times. Bush claims he believed what he said in October about a nuclear-armed Iran triggering World War III because he wasn't told until last week that Iran had halted its nuclear weapons program in 2003. Biden: "I refuse to believe that. If that's true, he has the most incompetent staff in American, modern American history and he's one of the most incompetent presidents in modern American history." The alternative explanation, of course, which Biden as a senator isn't socially licensed to say, is that Bush is a brazen liar.